Each year companies spend millions of dollars on tools, indirect materials, and supplies. To cut these costs, you have to go beyond driving the price of the product down. This seven-part blog series will show you how industrial vending will save your company money, increase operating efficiency and increase your productivity. Industrial vending machines don’t just dispense items and collect valuable data, but they also enforce discipline and accountability in the workforce. By tracking personal usage, you can compare what’s actually happening from shift-to-shift, machine-to-machine, and operator-to-operator. By creating a feedback loop, users of these products become conscious of the costs and become more responsible with the tools and supplies that they use. Employees hoard items when they feel access to them is not always available or when they suspect shortages will occur. When employees take more than they need, this creates shortages. The inventory system responds with purchasing more inventory, which is quickly taken out of inventory again, perpetuating a never-ending cycle of hoarding. Vending machines stop this cycle by limiting the amount any one person can take in at a specific period of time. 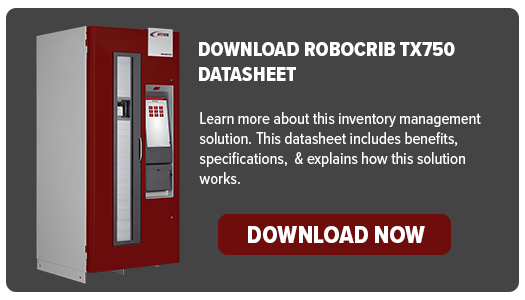 Industrial vending stops hoarding behavior because access is available 24-7 and inventory is automatically replenished, which also eliminates stock-outs. Many items are packaged in bulk, such as inserts, drills, welding rods, gloves, and many other parts that are often packaged in a quantity that is convenient to the manufacturer of the item. Often employees only consume a small portion of the package for their job. Even employees with the best of intentions might place a practically full package in their toolbox or workbench and with plans to return it to the tool crib tomorrow, but forgets the next day. The purchasing department then orders more, your on-hand inventory becomes inflated and your inventory forecasts are poisoned with bad data that will inadvertently raise inventory levels even higher. Industrial vending machines allow you to dispense exactly the right quantity for the task at hand, greatly reducing consumption, and the amount of inventory that is needed. Industrial vending systems have the ability to limit or prohibit usage based on a large number of parameters. Using access control, you can limit consumption by a trade or skill. For example, welders to welding supplies and machinists to machining supplies. An industrial vending system can also limit the number of tools or items that are consumed for a specific job or time period. If an employee is using special taps to tap holes for a titanium part and they should only be using 3 taps per shift. The system will not issue a 4th tap without a supervisor approval. This lets supervisors catch out-of-process problems which would otherwise go unnoticed. Using these features can significantly impact cost savings on tools and supplies and also reduce scrapped parts and wasted labor hours. You can also limit usage to a job by dollars or by the specific items that are required for that job. Further, you can control spend by departmental budget, employee budget, and much more. The incredible flexibility will give you an amazing amount of control and cost savings. By focusing on these five factors to drive a reduction in consumption, most users see an immediate 20% reduction in their spending when they implement an inventory management system. Companies with few previous controls, it’s common to see a reduction in excess of 40%. By simply reducing consumption, employees become more accountable, items become traceable, and stock-outs are eliminated. Remember, this is only part one of a seven-part blog series on solutions that increase savings, efficiency, and productivity. Stay tuned for next week’s post about how reconditioned items can reduce your inventory costs!